How would you react to the news that you were facing a debilitating illness, one that might affect you for the rest of your life? No one really knows, unless they are in that situation themselves. 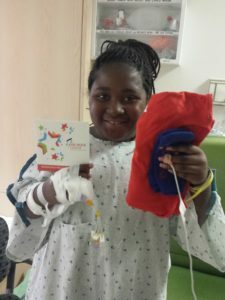 Kids Rock Cancer music therapy intern Ryan Eversole recently met 12-year-old Rahkia, who has sickle cell. During their songwriting session, the pair talked about how her illness impacts her and how it sometimes limits her ability to participate in activities she enjoys, such as dancing or playing outside. Ryan reports that Rahkia felt writing and singing about her experiences helped take her mind off the pain, and that she hopes to write another song in six months.